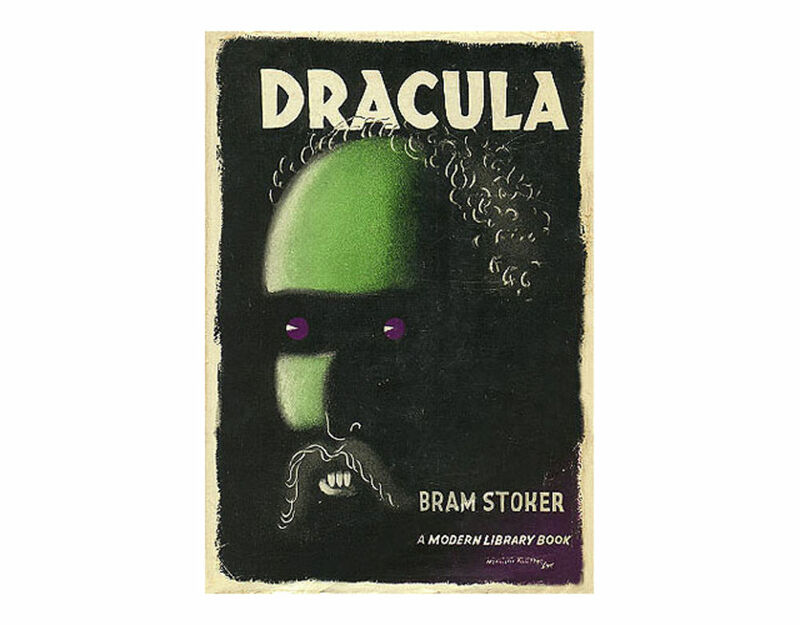 Since its first edition in 1897, Bram Stoker's blood sucking Count Dracula has continued to capture readers' imaginations. 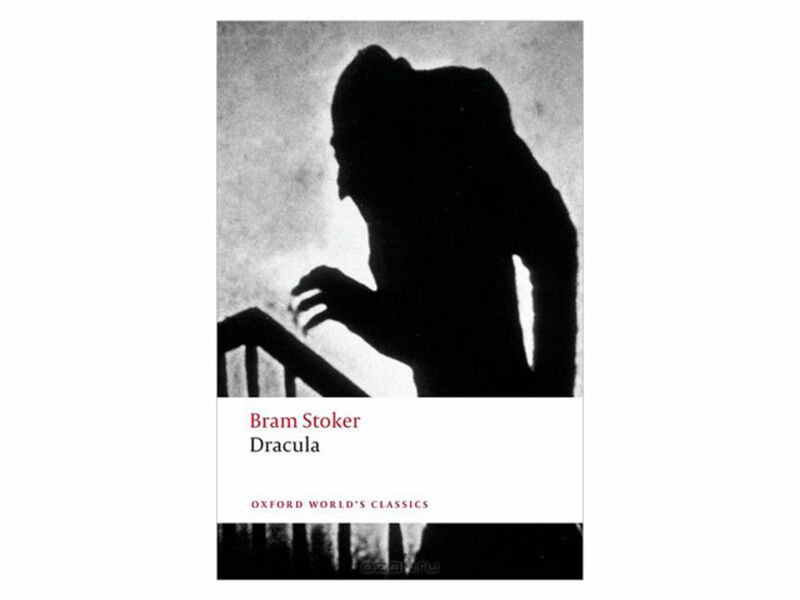 Emma Tucker looks at how this gothic horror story has been depicted over the years, through twelve classic book covers. 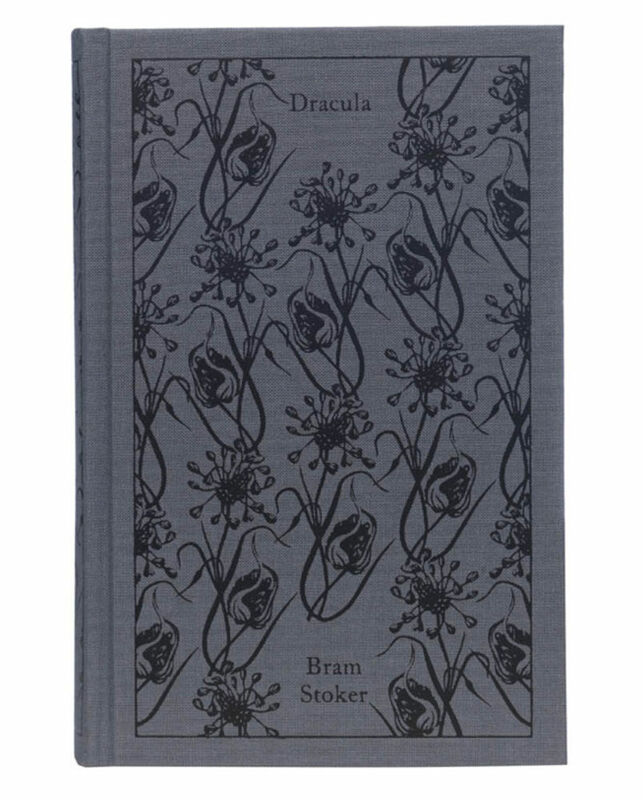 As with so many pieces of classic literature, each edition of Dracula calls up the ghost of its predecessors. 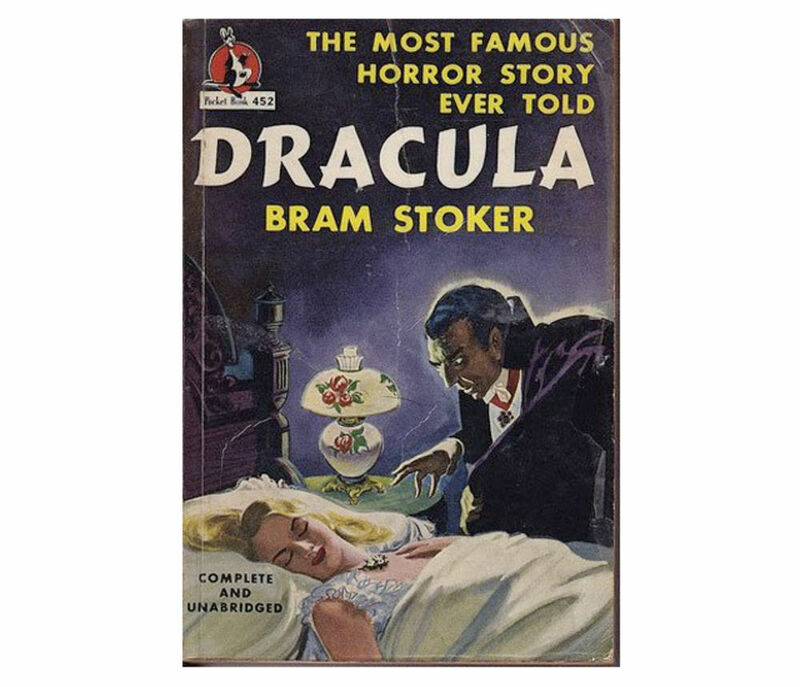 Much like Alice in Wonderland, designers of covers for the Count must tread carefully to avoid tired old graphic motifs. 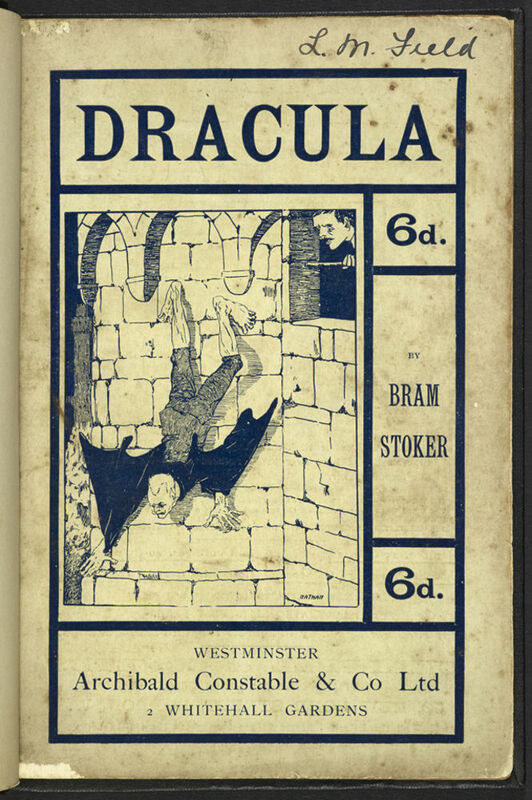 As Tim Pye – curator of the recent Terror and Wonder: The Gothic Imagination exhibition at the British Library – says, “There's only so many ways of depicting the Count, fangs exposed, heading towards the neck of his next virginal victim.” However while the 118-year-old book might conjure up obvious imagery, Dracula's visual history is not only surprisingly varied but has inspired a raft of contemporary covers that have done away with the standard bat-and-blackletter. The first edition of the book – published by Archibald Constable and Co. in 1897 – was a remarkably restrained affair, with just four red words and an 'R' with a beautiful fang-like descender. Although there's no records of who might have designed it, Pye explains the cover has led to plenty of speculation about the significance of the chosen colours. 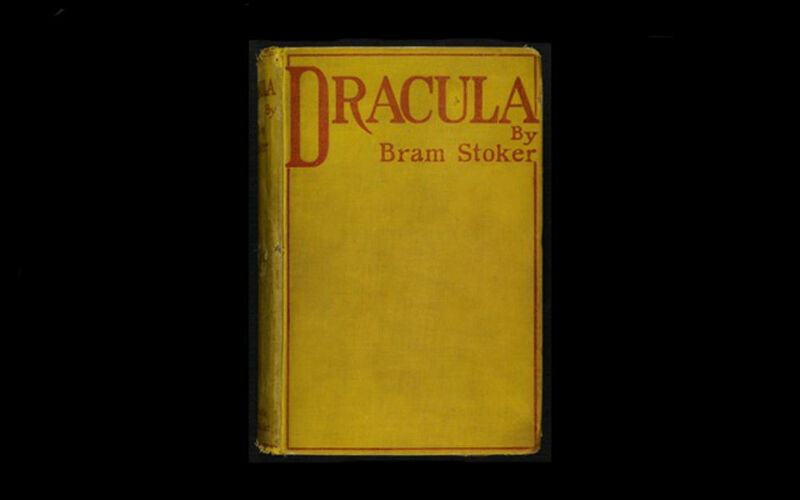 “Was the yellow used to suggest that the novel's content was risqué, daring and excitingly disreputable (much like Aubrey Beardsley’s The Yellow Book or the corrupting yellow novel read by Dorian Gray)? 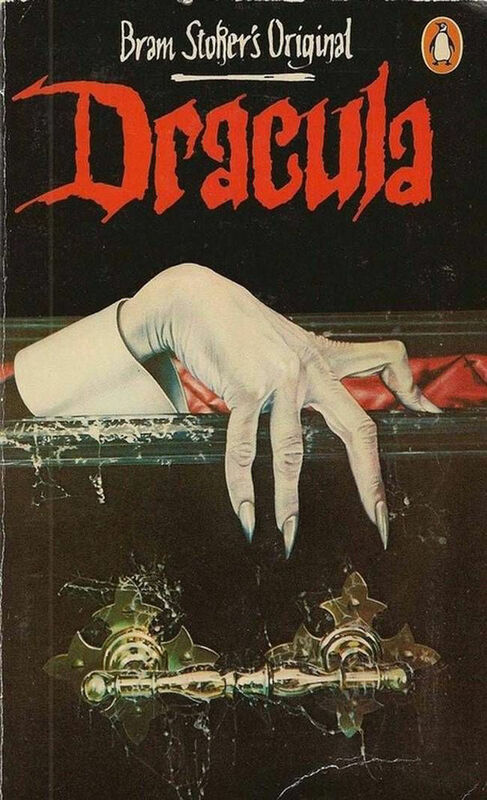 Does the red lettering hint at the role of blood in the novel? In these regards the cover ties the novel to the perceived degeneracy and unease of the Victorian fin de siècle,” he says. 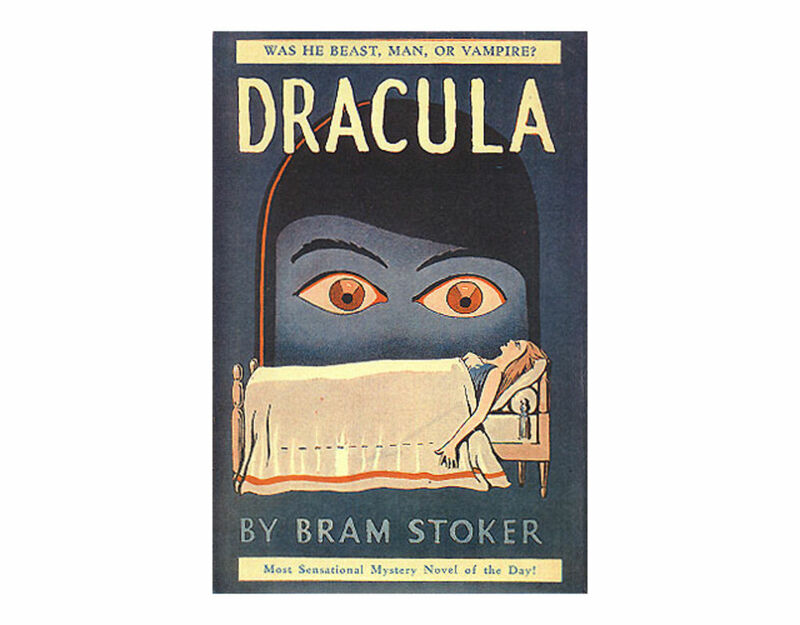 Later editions took more literal approaches, like the 1902 Doubleday cover which depicts a looming, shadowy cloaked figure; or the 1930s Grosset and Dunlap edition which features an enormous pair of eyes hovering over a women lying in bed. 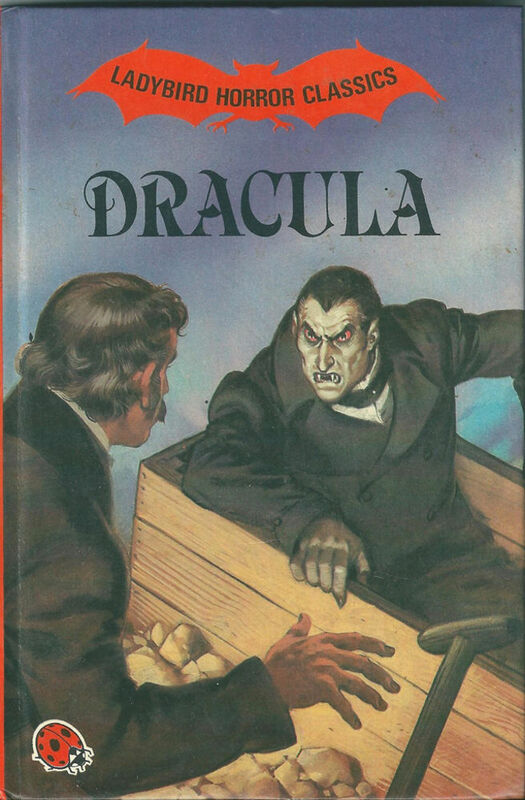 Some, like Scholastic Classics' 2002 paperback, which shows Dracula emerging from a coffin surrounded by spiky gothic type and architectural forms, were perhaps too obvious. 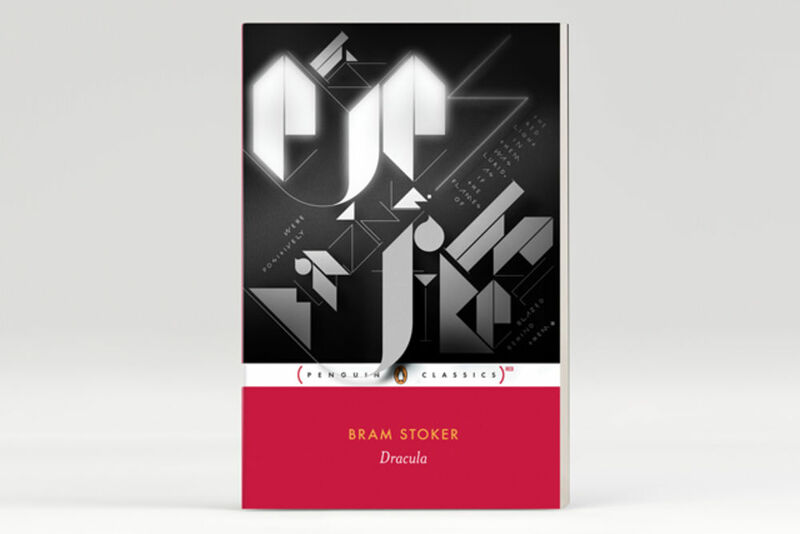 In latter years designers have taken less conventional routes, with design studio Non-Format creating a Penguin Classics cover that dispensed with imagery in favour of angular typography. Given a short excerpt from the text to create a cover with, the studio described the process as akin to “walking a tightrope across a vast cavern of cliché”. 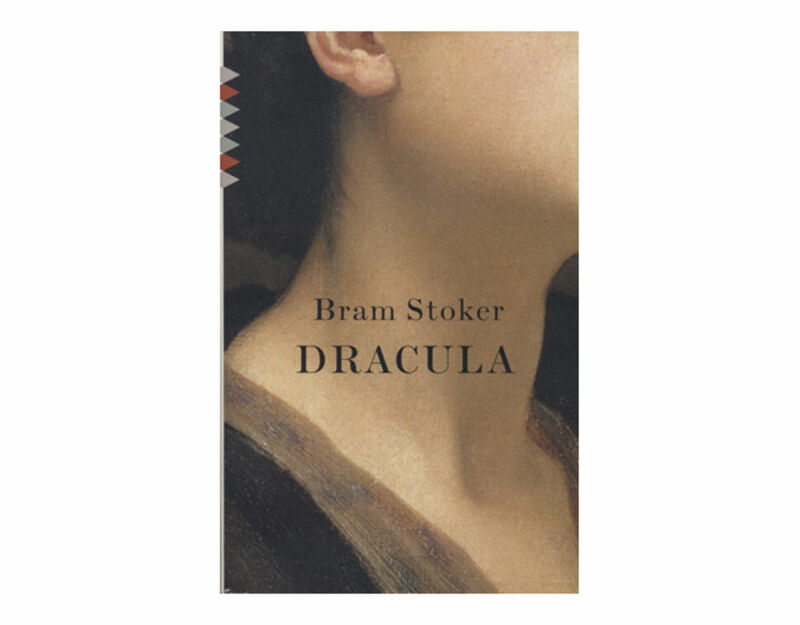 “It was a matter of creating a typographic expression that would convey a convincing Dracula vibe that wouldn't seem archaic or weighted down by past visual expressions of this classic vampire story,” the studio told Grafik. The end result was satisfyingly non-traditional, with a cover taken over by a tangle of garlic flowers. However while avoiding the novel's raft of go-to imagery is a challenge, curator Pye believes that the story's familiar status could give designer's greater liberty. 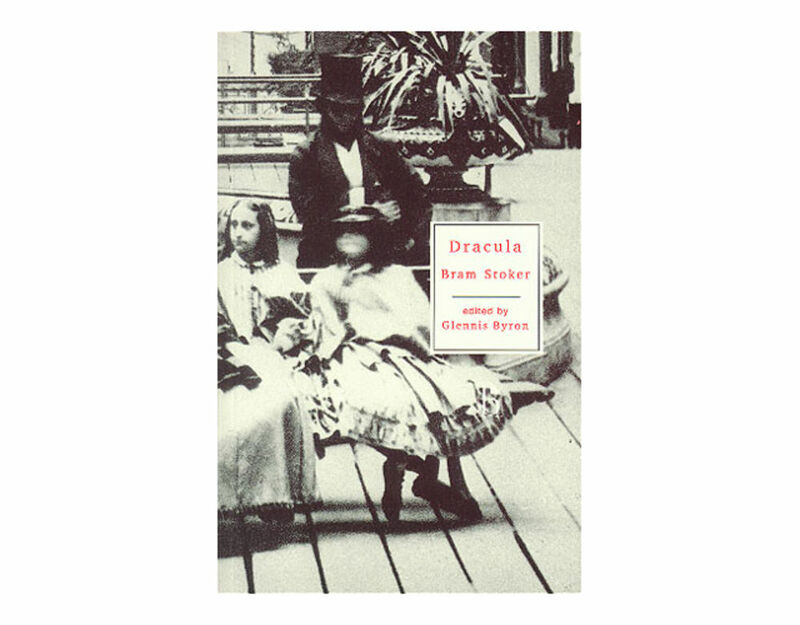 “Dracula’s incredibly striking imagery and themes, its horror and humour, provide huge scope,” he comments. “It helps that the story is so well known that a new design doesn’t necessarily need to be explicitly tied to the plot. With some help from Pye, Grafik looked back at twelve stand-out covers from the past 118 years. “Given that the quote was fairly long for such a small print area we decided to emphasise just a few of the key words and set the rest in a simple custom made geometric typeface. We chose ‘eyes’, ‘blazing’ ‘hell’ and ‘fire’ as the display words, which pretty much sum up the book right there. We deliberately combined a slightly disorientating mixture of typefaces, stroke weights, capitals and lowercase, often changing within a single word. We also placed some words and columns of text at a plus or minus 45 degree angle to further add to the unsettling nature of the composition. With thanks to Tim Pye, Non-Format and Coralie Bickford Smith.